In order for Khentrul Rinpoché to bestow the profound pith instructions of the Kalachakra Completion Stage, it is necessary to first establish a sincere and stable relationship with him as your primary Vajra Master by receiving the Four Higher Empowerments. To help Rinpoché evaluate if you are ready to engage in these advanced practices, please read through the requirements very carefully and then fill out the form that follows. The Higher Empowerments are only given to those disciples who have a sincere desire to achieve enlightenment in this life or the next through the practice of the Kalachakra Path. This level of commitment must arise from a clear understanding of what the path entails and why it is capable of producing the result of enlightenment. 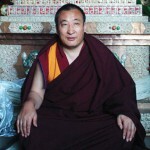 You can develop this faith through studying the path as presented in Khentrul Rinpoché’s books. At the Completion Stage level, you will need to make the Kalachakra Path your primary focus and make all other practices secondary. Unlike the Generation Stage empowerments, Khentrul Rinpoché will only give the Higher Empowerments to students who have the intention of practicing the Six Vajra Yogas under his direct guidance. This level of practice requires a strong devotion towards the Vajra Master in order to really be effective; therefore, you should strengthen your faith in Rinpoché by listening to his teachings and reading his books as much as possible before requesting the Higher Empowerments. While Rinpoché does not need to be your only teacher, you will need to follow his advice above all others. In order to authentically practice the Six Vajra Yogas, it is necessary to have established at least a basic level of realisation in both the common and uncommon preliminaries. How much time should be spent on the preliminaries will depend on each individual and the current stage of their development. To learn more about where to focus your energy, you should refer to the guidelines presented in “How to Practice the Kalachakra Path”. The more integrated the preliminaries are in your mind, the more effective you will be able to practice the Kalachakra Completion Stage. Please describe the subjects and texts that you have studied. Please describe all preliminary practices that you have engaged in since receiving the Kalachakra Empowerments for the first time. Please provide a detailed description of any retreat experience you have. Specifically noting the location of your retreat, how long the retreat lasted and whether the retreat was in a group or solitary. Please include any form of Dharma related activities such as studying, formal meditation and so forth. I swear that all information I have provided in this form is truthful. I am committed to taking the Kalachakra Path as my primary path above all others. I am committed to following the advice of Khentrul Rinpoché as my Root Guru and guide on the Kalachakra Path. I have read the material in Sacred Truth and understand the nature of the Vajra-Relationship and the importance of maintaining my tantric commitments. I have completed or promise to complete the common and uncommon preliminaries in preparation for practicing the Kalachakra Completion Stage. I wish to receive the Higher Empowerments and begin training in the Kalachakra Completion Stage.